I've gone through many boxes of eggs trying to cook tamagoyaki, that's Japanese rolled omelet. It uses a rectangle frying pan which is the same as an ordinary frying pan, but rectangle shaped. In short, you put a little oil in, put a layer of egg in and roll it up. Then repeat. 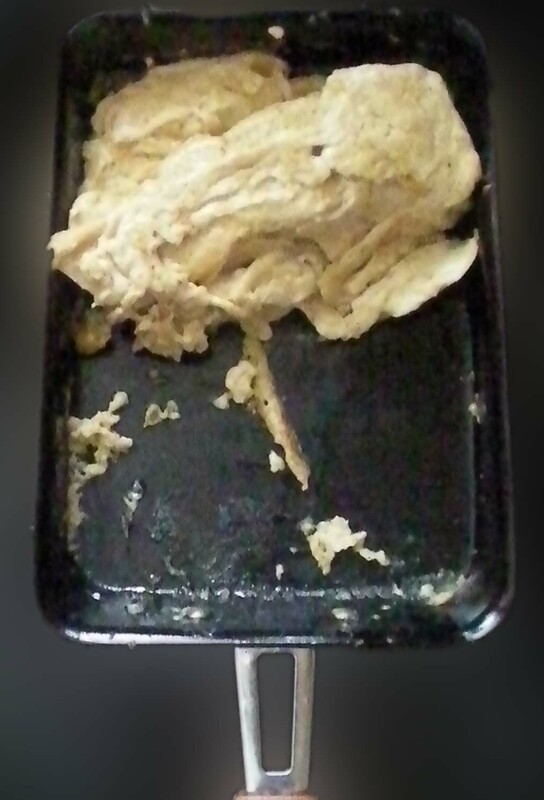 I've tried low heat, high heat, medium heat, taking it off the heat, small hob, large hob, pre-heating without oil, pre-heating with oil, a small coating of oil, soaked in oil, waited for it to set solid, rolled as soon as it started setting and every recipe and every youtube video guide on tamagoyaki - everything. The results are always the same: It sticks to the "non-stick" pan and it falls apart. Are you sure that the "non-stick" properties of your square pan are still OK. The pan in the picture looks pretty tired. I also note that the pan in the "successful video" has a ridged bottom. This gives more surface area to the bottom of the pan and gets more heat up into the egg mixture to cook it. Rolling when the consistency is correct is important. Looking at your example I would say that attempt needed more heat. The egg should be cooked on the bottom, while being 'jelly-like' on the top. This makes the roll stick to itself without sticking to the pan. You also need to just wipe down the pan with more oil after each roll. When in doubt turn up the heat and control by moving the pan. There's couple reason why it sticks. One of the reason is your sugar to egg ratio in your recipe. I've made tamagoyaki couple times when I was a sushi chef. The key is always less sugar to egg to keep from sticking. Also keep the pan HOT! and pour 1-2oz of egg mixture onto the pan at a time. All while you're moving the pan on and off the heat/burner constantly while you're cooking. Don't keep the pan on the heat the whole time you're cooking, it will burn the cooked part of the egg when you pour your egg mixture during the layering process. It's a lot of trial and error, but it's quite fun once you get the hang of it. It's a lot of moving on and off the burner. Also remember revisit your recipe and tweak it. Hope this helps. I've had the same problem. Did you wash your pan with detergent? Or did you use the pan to cook other things such as bacon? It sounds funny but when this happened to me my mom "cured" my pan and told me that I must never use that pan again for other things, only for tamagoyaki, and also that I must never wash the pan with detergent, only with very hot water. I can’t tell from picture but if that is a non stick ceramic coated pan that you have had awhile, i’d ditch it. I have yet to have a ceramic non stick pan that lasts. When THEY start losing their non stick attributes they are really bad. Not the answer you're looking for? Browse other questions tagged eggs frying frying-pan non-stick or ask your own question.